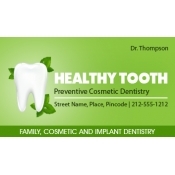 Encourage your patients to remain in touch with your dental clinic through any of these dental business card magnets. These promotional business card magnets lend great space for positioning business information and persuasive visuals. There is no shortage of opportunities when dentists cannot think of giving these promotional magnets. It is a perfect gift to be given during appointments, tradeshows, medical camps, business conferences and more. Free shipping is offered within the contiguous USA. 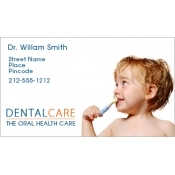 Dental surgeons and dental practitioners have always taken care to introduce their business through business cards. It is customary for them to hand out business cards to clients, visitors and anyone who steps into their clinic. 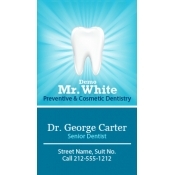 However, dental services do understand that these business cards may not bring them long term visibility, but at least it will help to position their business in a frugal way. 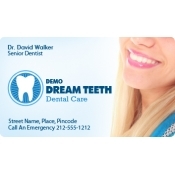 Promotional dental business card refrigerator magnets are an enhancement to paper business cards and they ensure long-term visibility. 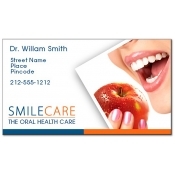 Dental magnetic business cards are the most affordable custom magnets in our collection. Dental surgeons and dental services can avail these magnets for large-scale distribution and stock them for a year. Additionally, they can mail it to their old patients or new patients as a mailer. 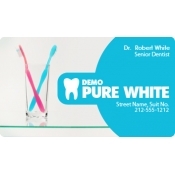 For enhanced advantages, they can even team it with other dental and orthodontist magnets such as dental appointment card magnets, dental fridge magnets, etc. Dental services can stock these refrigerator magnets so that they can hand it out as a gift anytime throughout the year because they remain in good condition. They can hand it directly to the client stepping into their office for an appointment or send it as a seasonal mailer to their regular clients or prospective clients. Being lightweight and adorable, they can easily carry it with them to tradeshow venues, too. We offer free full color printing which allows marketers to get their business information imprinted over these customized magnets in a persuasive manner. We offer free art setup, free online design proof and free design assistance on these personalized magnets. To know more about customization, distribution or influence of these customized fridge magnets, feel free to contact us at info@CMagnets.com or 855-762-4638 (Toll Free).